LONDON (AP) — Protesters seeking to oust London Mayor Sadiq Khan on Saturday launched a giant balloon over Parliament Square depicting him dressed in a yellow bikini. A small group of supporters watched the inflatable take to the skies, and the crowd cheered and shouted, "higher, higher, higher" as the balloon was launched. Protesters believe Khan has failed to curtail street crime in London, and some wore T-shirts reading "Make London safe again." LONDON (AP) — Critics of London Mayor Sadiq Khan have been given permission to fly a giant balloon over London that depicts him dressed in a bikini. LONDON (AP) — President Donald Trump will be arriving Thursday in Britain, his first visit since becoming president. He will meet with Prime Minister Theresa May and Queen Elizabeth II before spending the weekend at one of his golf clubs in Scotland. Trump has angered many in Britain in the last two years with a series of actions and pronouncements and many protests are expected. LONDON (AP) — Grieving family members joined community leaders Tuesday for a moment of silence to remember a man who died and a dozen others who were injured last year when a jobless man drove his van into a crowd leaving evening prayers during Ramadan. NEW YORK (AP) — Major League Baseball intends to announce next week the New York Yankees and Boston Red Sox will play two games at London's Olympic Stadium on June 29-30 next year, a person familiar with the planning told The Associated Press. Sadiq Khan made his intentions clear: He wants London to attract an NFL franchise and host a Super Bowl. The mayor of London spoke about sports and the city in an interview with Talksport, a London-based sports radio station and website. 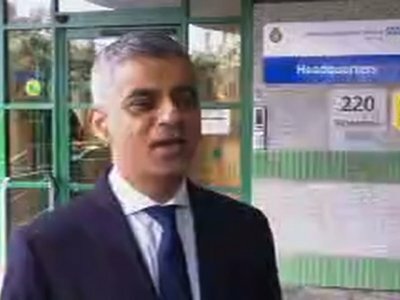 Khan said he was "ambitious" about attracting an NFL franchise to play its eight home games in the English capital. LONDON (AP) — President Donald Trump has canceled a trip to London to open the new $1 billion U.S. Embassy in the British capital, a move that avoided protests promised by political opponents. Some U.K. lawmakers had said Trump was not welcome in Britain after he re-tweeted videos from a far-right British group and criticized London Mayor Sadiq Khan following a terror attack last year. LONDON (AP) — A study commissioned by London Mayor Sadiq Khan shows that almost half a million jobs are under threat if Britain fails to strike a deal on future relations with the European Union before it leaves the bloc. The research released Thursday warns of a "lost decade" of significantly lower economic growth resulting in 482,000 fewer jobs and 50 billion pounds ($67 billion) of lost investment by 2030 if the worst-case scenario becomes a reality. LONDON (AP) — Rail passengers in some parts of England are facing travel disruptions this week after workers at five train companies supported strikes over the role of conductors responsible for safety on board. The long-running dispute involves members of the Rail, Maritime and Transport Union and the companies. Strikes are set for Monday, Wednesday and Friday on South Western Railway, Arriva Rail North, Merseyrail and Greater Anglia, while the strike on Southern is Monday. LONDON (AP) — British commuters are facing stiff increases in rail fares on the first work day of the new year. Travelers on Tuesday faced average fare hikes of 3.4 percent, prompting howls from activist groups and London's mayor amid complaints of unreliable rail service. Anthony Smith, chief of the independent group Transport Focus, said fares are going up as workers' wages stagnate, placing an unfair burden on commuters. LONDON (AP) — Facebook is opening a new office in London, adding 800 jobs and creating the biggest engineering hub for the company outside the United States. The social media giant will employ some 2,300 people in the U.K. by the end of 2018 — a vote of confidence in London despite Britain's looming departure from the European Union. Nicola Mendelsohn of Facebook says the company is "more committed than ever to the U.K."
LONDON (AP) — Meghan Markle is the first person who identifies as mixed race to marry a senior member of the British royal family — but that caused barely a ripple in Britain on Monday amid speculation about her engagement ring and the site of the spring nuptials. Naomi Campbell was racially abused aged five. The 47-year-old supermodel can vividly recall the first time she was ever made to feel different because of the color of her skin when another child used the 'N-word' to insult her. In a video interview with the Mayor of London Sadiq Khan for British Vogue, the catwalk icon recalled: "I remember when I was five a little boy with red hair called me the 'N-word'." Naomi Campbell was racially at the age of 5. LONDON (AP) — Drivers of older, more polluting cars will face an additional charge when entering central London as the city battles air pollution blamed for thousands of premature deaths each year. 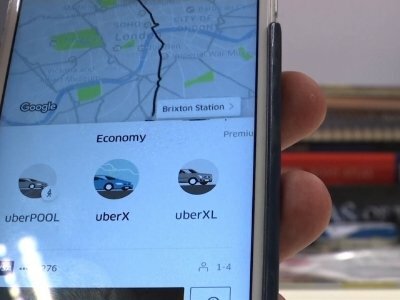 LONDON (AP) — London's mayor said Saturday that people angry about the decision by transit authorities to strip Uber of its license to operate in the city should blame the ride-hailing company itself. LONDON (AP) — Supporters of a proposed footbridge and public garden spanning the River Thames in London abandoned the project Monday after support from the city withered away. The trust established to build the Garden Bridge, which would have linked Temple with South Bank, shut down after failing to secure guarantees for annual maintenance costs. LONDON (AP) — London's mayor has called the Pride in London parade the biggest ever and says the celebration provides the "best antidote" to recent tragedies. 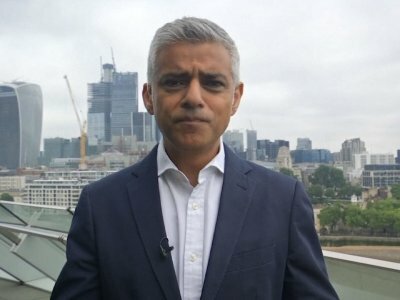 Sadiq Khan on Saturday told revelers at the gay pride event that the festivities provided welcome relief from recent bouts with terrorism. The annual parade honored members of the emergency services who were praised for heroic work responding to extremist attacks and the Grenfell Tower fire. LONDON (AP) — British Prime Minister Theresa May's government on Saturday rejected demands that she appoint commissioners to run the local council blamed for mishandling the response to the London high-rise fire, as the crisis deepened over who should be held accountable for the 80 deaths in the blaze. NEW YORK (AP) — The Mayor's Office of New York City is highlighting a newly created job in its administration — a "nightlife ambassador" to serve as a liaison between the city government and nightclubs. LONDON (AP) — London firefighters combed through a burned-out public housing tower Thursday in a grim search for missing people as police and the prime minister launched investigations into the deadly inferno, with pressure building on officials to explain the disaster and assure that similar buildings around the country are safe. London Mayor Sadiq Khan declared a "major incident" after the blaze engulfed the Grenfell Tower in North Kensington just before 1 a.m local time Wednesday. Around 200 firefighters, 40 fire trucks and 20 ambulance crews were at the scene. A week on from the London Bridge attack, Londoners are being urged to go out and enjoy the city on Saturday night, with bars and restaurants donating a share of their takings to a Red Cross fund set up for the victims. The Red Cross is urging people to "take a ride for London, eat a dish for London and say cheers for London." LONDON (AP) — The mayor of London says he doesn't care about the repeated insults he has received from the president of the United States, asserting Tuesday that he "really couldn't be bothered about what Donald Trump tweets."